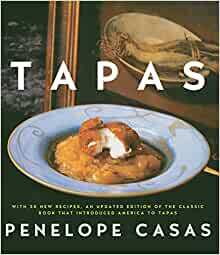 Penelope Casas is the author of La Cocina de Mamá, Paella!, ¡Delicioso!, Discovering Spain, and The Foods and Wines of Spain. 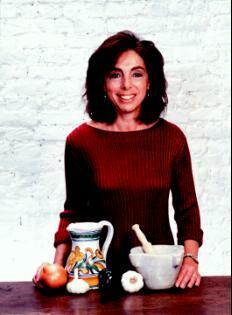 She has written about Spanish food and travel for The New York Times, Gourmet, Saveur, and Bon Appétit. She lives in New York and regularly hosts culinary tours of Spain. What a disappointment. Just got this in the mail, it is supposed to be a gift, and the book jacket is wrinkled and stretched out like it came off a dusty waterlogged shelf in someone's basement. Was expecting more pictures, rather than merely four color pages of photos smack in the middle of the book. The photos look they were original to the 1985 original publication. Haven't tried the recipes, so can't speak to those, but sure would be embarrassed to admit I payed $24 for this. "Tapas" gives cooks a plethora of recipes from vegetarian to veal, pastries to pates. There's also a wide range of complexity - recipes range from 3 ingredients to 20. For variety and authenticity I would give this book a 5 star rating but it falls short because there are very few photos other than a handful in the middle of the book, and the arrangement of recipes is not ideal. 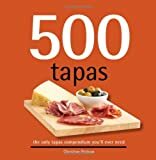 I would prefer the book be sorted by main ingredient, seafood vs. beef for example, but it is arranged by type of tapas (tapas in sauce vs. tapas with bread) which I find much more impractical. 5.0 out of 5 starsNew fan of Tapas dishes and love making them at home. After returning for a couple weeks in Spain, I found myself missing those light evening meals of tapas and tinto. This book helped me identify some of my favorites so I can make them at home. Easy to follow instructions make this book a winner. 5.0 out of 5 starsAll good. When I get a new cookbook, i go through it and flag the things I want to try. This has so few that don't look interesting that it defeated the process. everything looks wonderful, and I've already tried a few. Very pleased. This is one of Penelopes first books and in my opinion it rates a bit higher than ok. I don't want to be too harsh as the book is 20 years old but the downside is that it is poorly assembled with all of the photos at the center of the book and brief descriptions for each dish. Having said this there are many many recipes (about two on each of 200 pages) making this a good source of ideas and information, but if you're planning on flipping through looking for a photo of something appealing, this is not the book for you. I returned the book. Many of the recipes seemed fairly complicated. I was looking for recipes for a one-time tapas dinner and found what I was interested in online. This is THE tapas cookbook. Written for us regular folks. Easy to understand without exotic ingredients which are hard to find. Lots of interesting asides as well. Recommend this book.